The 15,469 deadweight ton rig was late last week installed onboard heavy lift vessel “Hai Yang Shi You 278”. The operation was successfully conducted in the Kola Bay and the rig is now on its way home, Russian state port company Rosmorport informs. Data from sea tracking service Marine Traffic show that the vessel and rig by midday Wednesday had made it to the waters north of Norway’s North Cape. 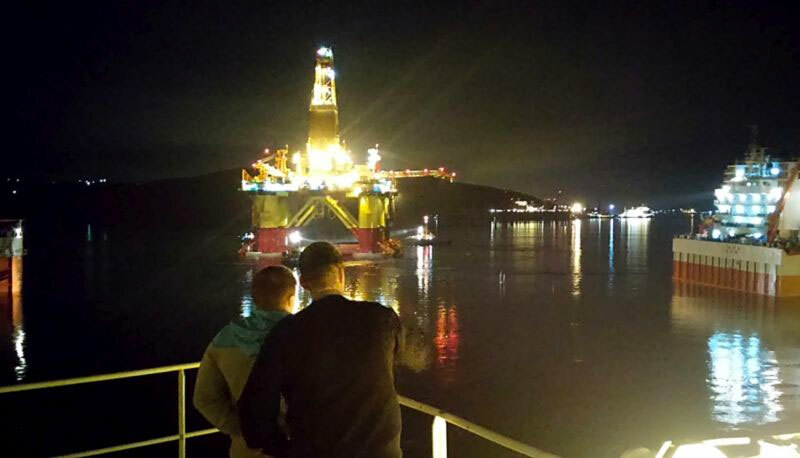 The Chinese rig has spent more than three months in the Russian Arctic where it has drilled in Gazprom’s Leningradskoye license, an area located west of the Yamal Peninsula in the Kara Sea. Results from the drilling is not yet known. However, Gazprom has previously estimated the resource potential of the field to more than 1 trillion cubic meters of natural gas. Along with Rosneft’s drilling in the Khatanga Bay, the Leningradskoye operation is the only well drilled on Russia’s Arctic shelf this year. The «Nanhai VIII» is owned China Oilfield Services Limited (COSL) and can operate on water depths up to 1,400 meters. The drilling depths can be 7,600 meters. The rig has been hired by company Gazprom Neft and has on previously occasions been on drilling assignments in the Russian far east. The semi-submersible installation in late June this year made a stop-over in Murmansk on its way to the Leningradskoye area.